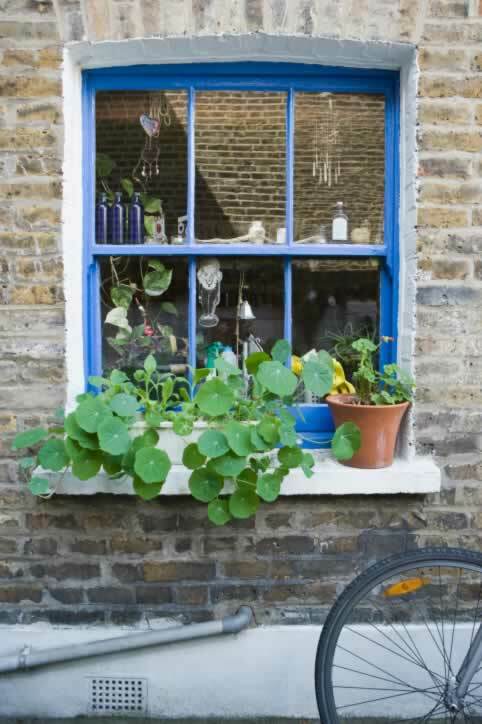 Every section of this delightful window, partitioned by vertical wood muntins, frames something worth investigating. The antique bottles in the window couldn't be more appropriate to the weathered brick walls, as are the flower pots on the deep window sill, and even the add-on plumbing that wasn't part of the original building. Can't you picture someone inside rushing over to slide up the bottom of the double-hung window to visit with a friend or say "hello" to the postman? The white-painted sill and brick ends that frame the window really set off that blue willow color, and the discerning eye won't miss that hint of an arch over the window, which is emphasized by the vertically-set bricks above it. The bicycle gives the only clue that this is a 21st century view, but everything else screams "historic!"